Last weekend I made a whole buncha smoothies. 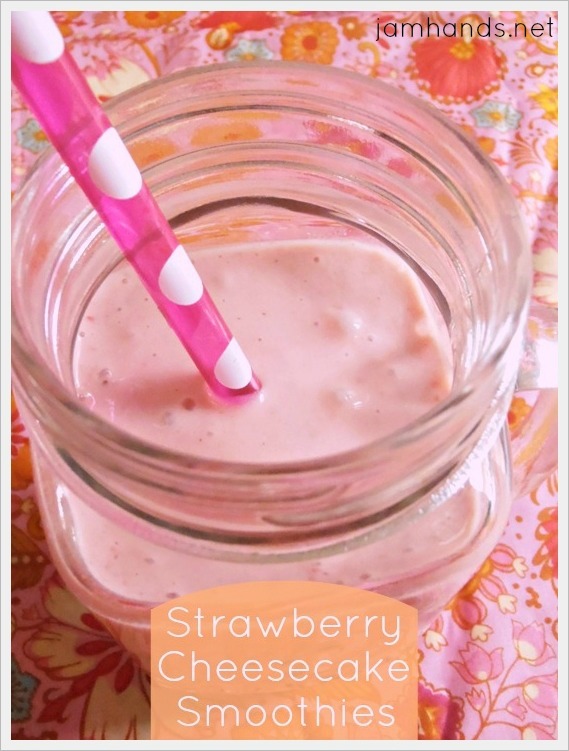 I was testing out what ingredients gave the best flavor and consistency for Strawberry Cheesecake Smoothies. I thought today I would share with you a few things I learned. Primarily, I was testing the difference in flavor between using cottage cheese or cream cheese. If you are wrinkling your nose at the idea of cottage cheese, let me assure you that it blends up totally smooth and there are no curds at all. Between the two choices, cottage cheese won hands down. The cream cheese smoothie was completely overpowered in flavor by the cream cheese, much too sour and you could barely taste the fruit. I tried testing using different combinations of milk, cottage cheese, yogurt, and frozen milk ice cubes. In the end I felt like both the yogurt and the cottage cheese were necessary to give the smoothie a nice thick consistency. A spoonful of sugar or powdered sugar was necessary I found because the fruit was a little tart, along with the cottage cheese, and the little bit of sweetness added really improved the flavor overall. Having tried all this, I found that my favorite recipe was from ben and birdy. Many thanks to them for the delicious recipe. Enjoy! 1. Mix everything together in a blender and blend until smooth. Recipe from ben and birdy. Sharing this recipe at the following fun link parties. Question ... why were you testing smoothies? Sounds like an interesting way to spend a day, though. I just figured out the calorie count on the one you gave the recipe for ... if you don't use reduced calorie ingredients, it comes in at 463 calories. Wow.But, if I used low fat yogurt and 2% cottage cheese, it weighs in a lot better at 293 calories. Much better. Dessert for breakfast! I love it! Great smoothie! I can't bring myself to drink smoothies when it's cold outside, but I've been so looking forward to when the weather warms up so I can get on a smoothie kick again and I will definitely try this one..it sounds delish!